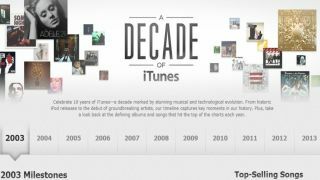 In celebration of ten years of its digital music service, Apple has launched an interactive timeline on its iTunes Store, taking us back through its landmark moments of the last ten years. The first iTunes advert, the birth of the iPod Mini, the download of the 5 billionth song, the day that iTunes finally got The Beatles. All of which brings us up to the most recent big event – the release of Justin Timberlake's The 20/20 Experience. Ah, good times. It's not quite a decade yet – that will officially happen this Sunday – but you can go check out the feature right now and remember a time when people knew who The Fray actually were. Why not check out a timeline of our blips while you're at it? They're quite tasty.